Sadly the Company is no longer in eBook business. On the other hand, because of this you can do much more with your eBook device than ever in terms of creating your own content. iDEO designed descendants of Softbook (REB1200 and GEB2150) are probably the finest eBook devices that were ever available to consumers. Rocketbook descendants (REB1100 and GEB1150) gave a better bang for the buck, and were marvels of engineering in their own right. And now all you can do is hunt down some of them on eBay. 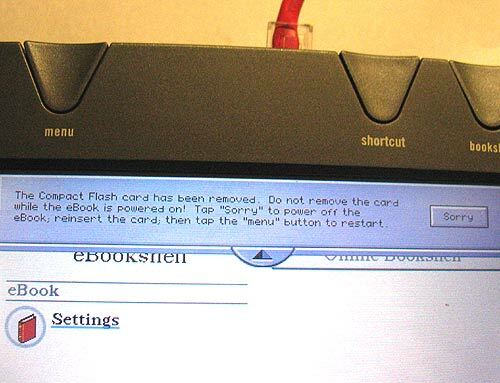 I am going to write more about hardware eBooks later, but for now enjoy this funny error message from my REB1200. Next PostNext Uhhh, Ummm, Technically, God ….